The view from my Mine-Resistant Ambush Protected (MRAP*) vehicle is one small windows looking out the back. Sometimes I wonder how did I end up here? How did I end up in the back of this MRAP? This wasn’t the Air Force deployment I had been hoping for. But here I sit and this is what I see. The view from my MRAP starts out from inside the wire (on base) a safe and secure place. The enemy is not there, just dusty roads and a village of makeshift buildings and tents. My rifle is on my knee and my 9mm is strapped to my hip. My protective armor covers my chest, my helmet covers my head. I can see the gunner legs hanging below the roof, his seat is above me and to my right. The driver weaves and bobs through the concrete barriers as we head out of the safety of the base. The view from my MRAP is a road likely made of dirt and wide enough for the MRAP and not much else. The houses are made of mud and market place is full of hanging meats likely covered in flies. There is also fruit, nan and other trinkets to buy. The market is a busy place. 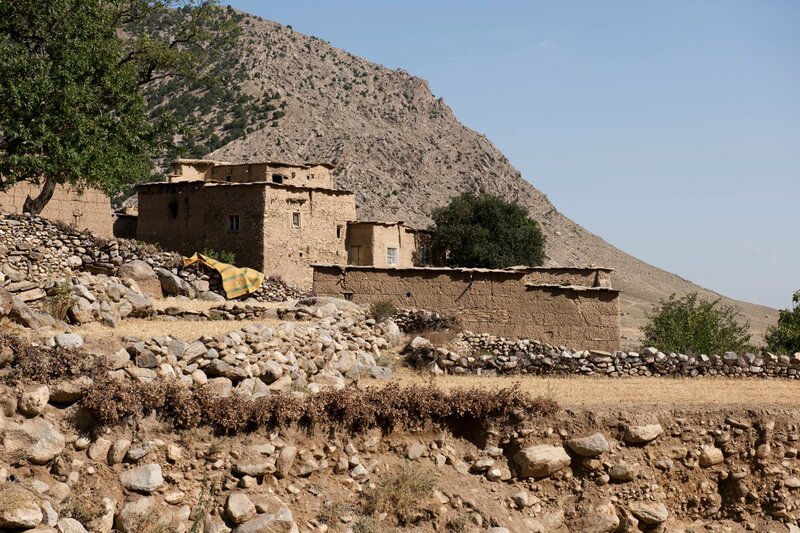 We drive on out into deeper into the heart of Kapisa to see roads, schools and government buildings. We may pass a wheat field or a well; sometimes children even stop what they are doing to offer a friendly wave. If the women are close by the road they often run away and hide. And if they are working in the fields they stay in their place hidden, but visible. A part of daily life. We arrive at the first objective and the large door at the back of MRAP opens. I see children all around waiting to see what the Americans are doing today. Next, I see my security element leading me on a safe path to the school we will inspect. Across the way, I see the construction workers busy and the children sitting under trees learning from their teacher waiting for their school building to be completed. Finally, I see the beauty that is Afghanistan and wonder if all that we are doing will make some sort of difference. Then it is off to the next objective and back to my window where often all I can really see is the MRAP that is behind me. I spent nine months in Afghanistan and went on countless missions where I stared out the back of that window. I never really got over how beautiful Afghanistan was and how much potential was there. Afghanistan is a beautiful place with a strong group of people. Do I miss being deployed? No, I definitely do not. And even though my journey took me far away from my family and friends. I think that it was worth it and hopefully the part I played made a difference. *MRAP is an acryonm for Mine-Resistant Ambush Protected. Military members use MRAP as a slang for the truck you are driving in while overseas. I didn’t know what MRAP stood for. I had to look up what the acryonm was because it was never used. It is kind of a tongue twister so it is easier to just say MRAP. We also would ride in MATVs which is a MRAP (the M actually stands for another acryonm) All Terrain Vehicle. My dads were both military, and my mom was a skydiver with the Screaming Eagles parachute club. Your posts take me out of myself, and let me visit that world. Thank you so much for sharing. I’m so glad you like my posts. Thanks for the encouragement to help me continue on sharing my experiences.